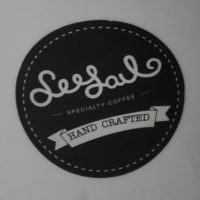 Seesaw is a roastery and a chain of seven Shanghai coffee shops, although this one, Seesaw 433, is the original, having opened in 2012. Like most of the places I visited in Shanghai, it helps to know where it is, only more so in this case, since it’s at the back of a design centre, with no obvious signs on the street. If I hadn’t have known it was there, I would have missed it completely. However, it would have been a shame to walk past since it’s a beautiful spot, with an enclosed courtyard, complete with glass roof. Perhaps because the courtyard is completely enclosed, it’s no smoking, but despite this, it can still get very hot and humid. If you want air-conditioning (or power outlets for your laptop), you’ll need to head inside the coffee shop proper, off to one side of the courtyard. Seesaw roasts all its own coffee in a dedicated facility. There’s a seasonal house-blend and single-origin on espresso, with six or seven further single-origins on pour-over/cold brew, with all the typical origins represented. You can also buy the beans to take home with you, while if you’re hungry, there’s a selection of western-style cakes. March 2019: Sad to say, Seesaw 433 has closed. It looks to me as if the whole building has been vacated rather than Seesaw itself moving/closing down. On the south side of Yuyuan Road, west of Jing’an Park, there’s no visual clue to Seesaw. Have faith though and head down a long (and very unpromising) passageway which feels like the driveway to a car park. Just before the end, a pair of glass doors on your right lead into the amazing courtyard, with Seesaw off to the right in a spacious ground floor unit at the back of the building. A full three storeys high, bright and spacious, the courtyard’s a wonderful spot to sit and drink your coffee, as long as you can stand the heat/humidity. The seating area occupies about half the width of the available space, with a broad corridor on the left, separated by pillars and planters, giving access to a sweeping staircase at the back. This leads to the other floors, including a balcony on the first floor which overlooks the courtyard on all sides. There’s an eight-person communal table on the left as you enter, followed by two rows of three/four-person square tables, one row to the left against the planters, another down the centre, each containing three tables. Finally, against the right-hand wall, a three-person bar looks in on the counter-area inside through an open hatch. Next comes a pair of large, sliding doors, drawn back to allow free passage, beyond which is a two-person table which acts as a bar, facing the wall. Stepping inside, the counter is to your right, with seating to your left. This is arranged around the three walls, providing some symmetry with the counter, although there is a cluster of tables in the centre. A wooden bench with tables runs along the back wall, while two round, four-person tables, the second by the left-hand wall, line the middle. There are two more square tables against the front wall, plus a little, one-person bar in the window. Finally, you can sit at the counter, either at the front, which faces the seating, or down the side, which runs parallel with the back wall. As is the case in the courtyard, each side has three bar-stools. A word of warning about the layout: a week after I visited, Seesaw was closed for a month for “redecoration”, so expect my descriptions to be somewhat out-of-date! Coffee in Shanghai often comes with a western price-tag and then some, with Seesaw serving its pour-overs for 38 RMB (a touch under £5), with the exception of the Geisha, while the retail bags averaged around £8 for 200g. Although faced with a considerable choice, as soon as I spotted a Chinese coffee from Yunnan Province on the pour-over menu, my decision was made. I paired this with a slice of Grandmother’s Cake, which was very Italian in concept, with excellent pastry and a good, creamy filling, but not too sweet. My coffee came in a lovely, double-walled glass, whereas other people seemed to be served with a carafe, a small glass on the side. On closer inspection, this was the ubiquitous iced coffee, the carafe holding the ice before the coffee is poured over it. It was a surprising brew, more subtle than my first taste of Chinese coffee at Sumerian Coffee, but still with plenty of body. Interestingly, it became richer and bolder as it cooled. I suspect that Yunnan coffee will never win over those who like fruity Kenyans or the subtlety of a good Yirgacheffe, but if you enjoy something bold yet distinctive (think a good Sumatran, for example) then you’ll probably love this. I was sufficiently impressed that I bought a bag of it to take home! March 2019: Despite the closure of Seesaw 433, Seesaw itself has gone from strength-to-strength, with branches in four Chinese cities. You can see what I made of its branch in the IFC Mall. For a different view of Seesaw 433, try local blogger, Sugared & Spiced. This entry was posted in Cafe/Roaster, Cake, Closed, Coffee Gardens, Coffee Shops, Evening Opening, Laptop Friendly, Retailers, Shanghai and tagged AroundTheWorld2016, China2017 by Brian Williams. Bookmark the permalink.